WASHINGTON — President Donald Trump on Friday named acting Veterans Affairs Secretary Robert Wilkie his latest pick to be the next permanent head of that department in the administration’s latest attempt to bring stability to the second-largest federal bureaucracy. Wilkie has served as acting secretary since the firing of David Shulkin 51 days ago, amid a travel scandal and questions about his leadership style. Trump’s first pick to replace Shulkin, former White House physician Rear Adm. Ronny Jackson, withdrew his name from consideration last month after allegations emerged about unprofessional behavior and medication mismanagement in his role as the administration’s top doctor. Wilkie, who has been serving since last fall as the Defense Department’s under secretary for personnel and readiness, has received generally positive reviews from veterans groups and lawmakers since taking over the top VA role. But both AMVETS and VoteVets.org have openly challenged his appointment to the post, saying that Trump illegally bypassed VA Deputy Secretary Thomas Bowman in installing Wilkie in the temporary leadership role. 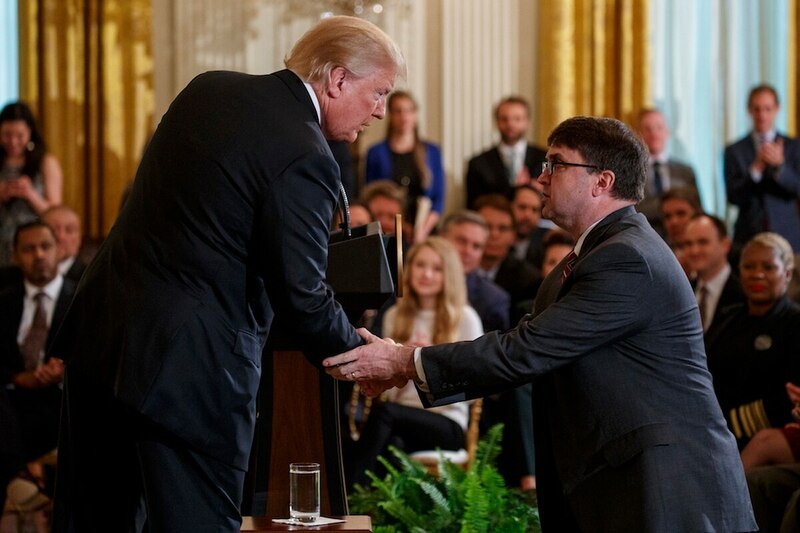 Trump at Friday’s event apologised for ruining the surprise, but also praised Wilkie for his work in recent weeks to advocate for sweeping legislative reforms to the department’s community care programs. Just days prior, Wilkie said that his top priorities as interim VA head would be to work with lawmakers on that reform plan — the House passed it on Wednesday, the Senate is expected to follow suit next week — and to finalize a deal for an electronic health records overhaul, which took place Thursday afternoon. Wilkie, 55, is an Air Force Reserve colonel who previously spent time in the Navy Reserve and the son of an Army artillery commander. He has spoken frequently about growing up on military bases, and of the challenges his family faced in dealing with his father’s combat injuries. He served in the Pentagon under Defense Secretaries Robert Gates and Donald Rumsfeld as an assistant secretary, and previously special assistant to President George W. Bush for national security affairs. He also served as a senior advisor to Sen. Thom Tillis, R-N.C., prior to his recent Pentagon appointment, and was touted as a worthy replacement for Jackson by Tillis in recent weeks. In a welcome message to staff last month, Wilkie promised to continue to build a customer-service focus for veterans programs and to tamp down agency infighting. Department leadership has been in disarray since the firing of Shulkin, who accused political appointees within the White House of working to privatize VA operations and undermine his reform efforts. Administration officials have denied those allegations. Those privatization concerns are likely to face Wilkie when he comes to Capitol Hill for his confirmation hearings. In recent weeks, Wilkie’s staff at VA have denied accusations of trying to shift substantial financial resources outside the department’s health care system to benefit private companies, but have also insisted that the medical demands of America’s veterans are too expensive to force federal VA clinics to handle the entire workload. No timetable has been set for that confirmation hearing. The process typically takes a month of background checks and preparatory work before the Senate will schedule a date, although Wilkie’s confirmation for the Pentagon post just last year may help shorten that timeline. In a statement, Senate Veterans’ Affairs Committee Chairman Johnny Isakson, R-Ga., praised the choice.